A couple of weeks ago I had the privilege of conducting young musicians from the In Harmony Telford and Stoke programme at a community concert in Telford. This was the climax of the concert, with 380 young musicians aged 6 – 14 performing Ode to Joy together! 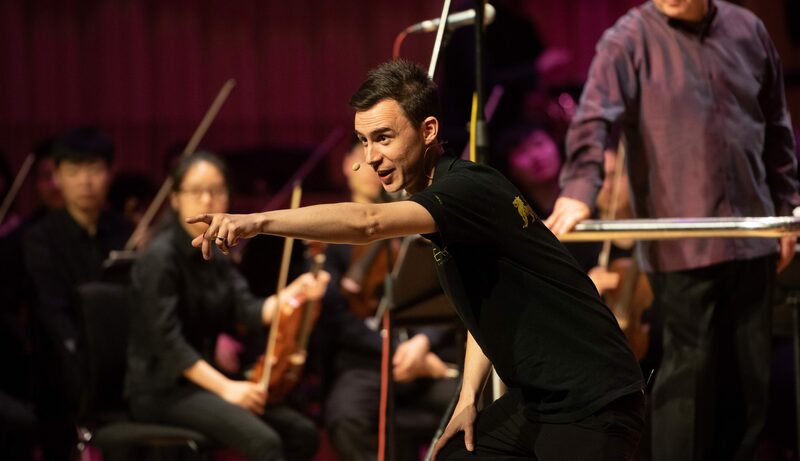 Birmingham Conservatoire’s LEAP (Learning & Participation) Ensemble will be performing my latest piece Endah Veneerah for the third time this Saturday 11 June 2016 at the Adrian Boult Hall in Birmingham as part of the City of Sounds Festival. Click here for more information. Endah Veneerah steals styles of popular music from the past few decades and mixes them together with a bit of Jazz and Western Classical music. Music evolves gradually over time – for example, although the era of disco is sadly over, the style continues morphing into new genres – and so it features in some way in this piece. Here’s my latest piece. I wrote this soundtrack for the wonderful choreographer Suzannah McCreight‘s latest creation. It’s a piece that explores autism, shared humanity and finding places of freedom within restriction. This is a video of the live performance which took place at the MAC, Belfast as part of the Evolve showcase of works in progress, supported by Dance Resource Base. The appendages connected to the dancers, restricting and weighing them down, were created by artist Heather Wilson. 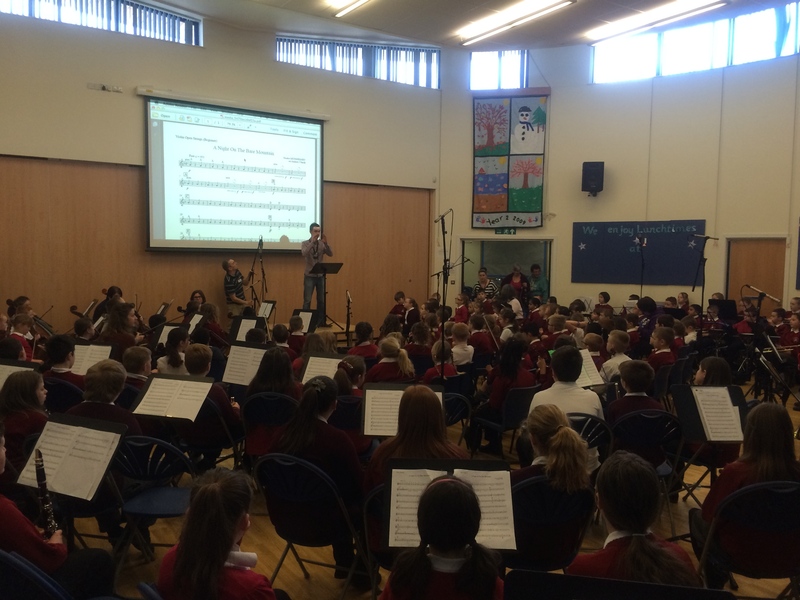 Back in March I was involved with a whole school music video with Old Park Primary, where I work with In Harmony Telford and Stoke. It was all part of the nationwide BBC Ten Pieces initiative, where schools across the country come up with a creative response to the film made specially for Primary School children. The piece we performed was an arrangement by Andrew Smith of Mussorgsky’s Night on a Bare Mountain. 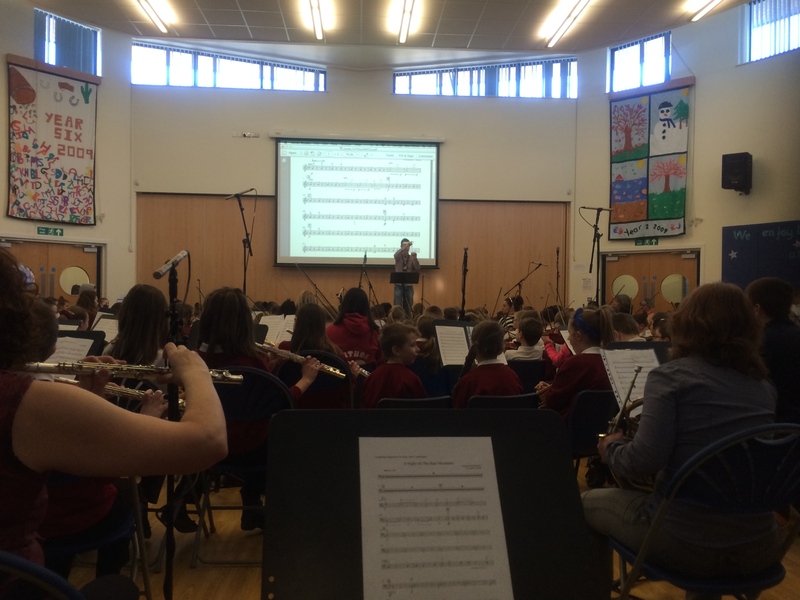 The 3 school orchestras came together (all 300 children) with a team of professional musicians to record the soundtrack in the school hall – which was immense! Their concentration was so good and they coped really well with the pressure of the recording, with the mics and crew. As I conducted it was amazing looking out across this giant sea of children who were absolutely loving the feeling of playing together as an ensemble. Quality! So then we spent a week with a brilliant and patient film crew – jam-av and each year group in the school – from Foundation through to Year 6 – worked with the fabulous Jo Billingham to choreograph some sort of movement. The teachers worked tirelessly to help the children produce costumes to go with the action. 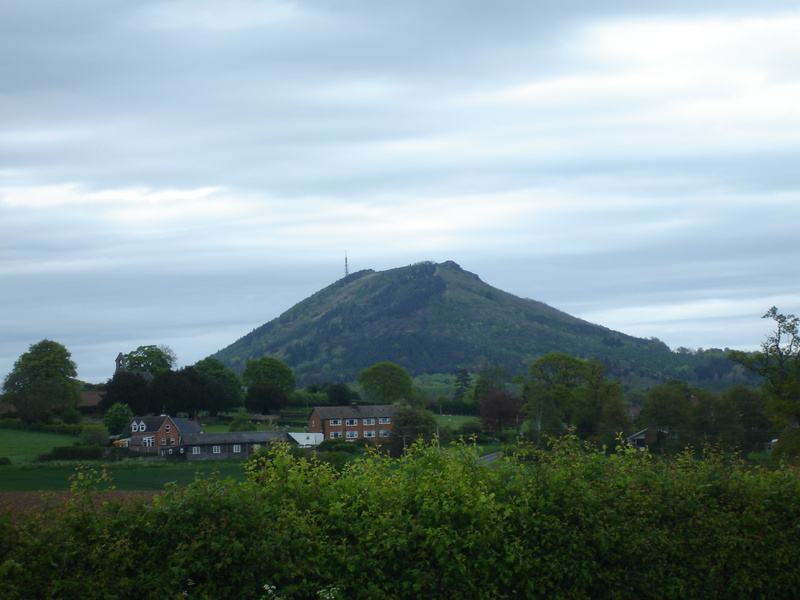 One highlight was taking the Chamber Orchestra on a trip up the Wrekin (see my previous post). And then it was up to the film guys to work their editing magic! Last week we premiered it with 5 showings at the local Odeon Cinema (big thanks to them for their generosity!) so the children and their families could see themselves on the big screen. Now the film is up on the BBC website – you can view it here. Conducting on top of the Wrekin in Telford! Last week I was filming a music video with Old Park Primary school in Telford – more about this in a future post… Anyway we had a fantastic time going to different locations with the children – including taking 30 of them on a walk up the Wrekin – with their orchestral instruments! 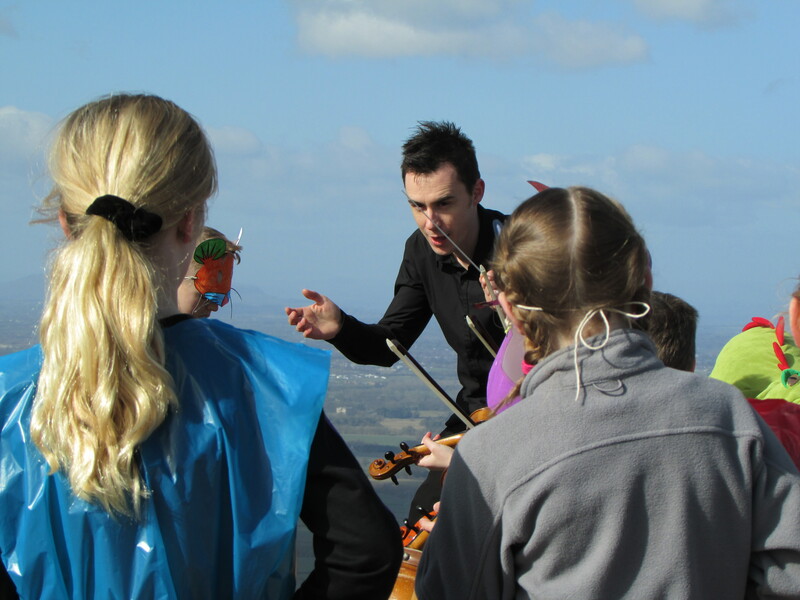 Here’s me conducting the children on top of the hill as we were filmed! The film is currently being edited but I will be sharing it at the start of April. Year 2 at Old Park Primary singing and playing their violins and cellos to the song I wrote for last year’s world book day. The story of Alice in Wonderland (in brief). 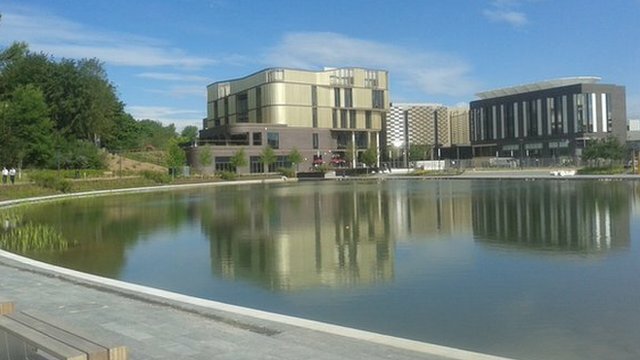 Just a quick note to sat that my friend Richard Shrewsbury and I have written a piece for the opening of the new Telford Southwater development. On Saturday 18 October, the grand opening of the site will have a big event running from 2pm – 8.30pm. Around 8pm-ish there will be a procession (I don’t know if the details are secret so I’m not going to go into detail!) with music written/arranged by Richard, culminating in an awesome fireworks display choreographed to music – a sort of electronic dance track – written by Richard and me. It should be a fun event so head on down! Free Radio are hosting the day – click here for more details. Photos courtesy of Noelle T. Angus.